The San Jose Blog: Massive 2 MILLION SQFT Office Project Proposed for North First! 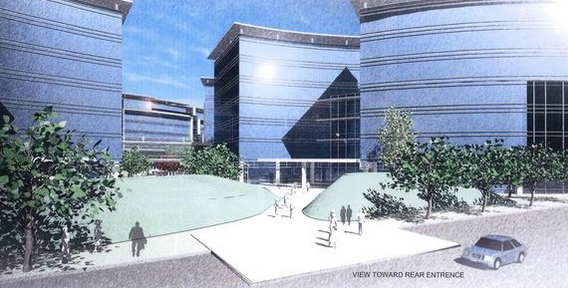 Massive 2 MILLION SQFT Office Project Proposed for North First! 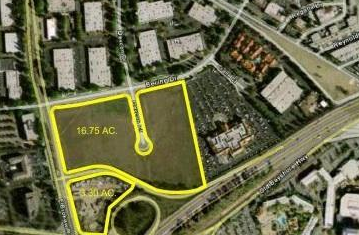 Nathan Donato-Weinstein from the Business Journal nabbed what will likely be the largest development scoop of the year. 10 freakin towers proposed on North First Street!!! The project spans 20 acres at First Street and Brokaw which consists of some empty land and the Bay 101 casino. It would likely be built in two phases, Phase 1 on the area currently vacant with Phase 2 coming in after the casino moves to their new home closer to M8trix. The buildings would each be about seven stories--which is tall for your typical tech campus, think Brocade in the @First area. Total square footage would clock in at a jaw-dropping 2,025,350 SQFT. 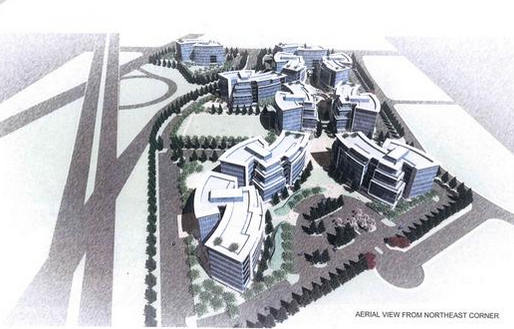 In terms of sheer size of an office project, this would come second only to the new Apple Campus in Cupertino. 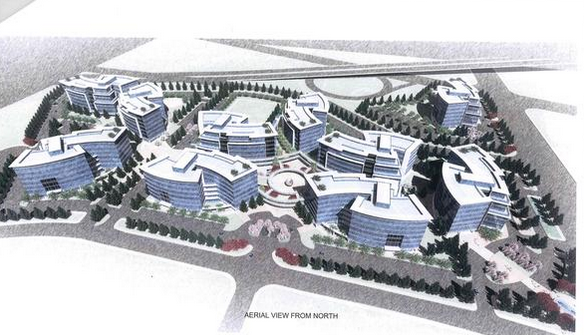 This dwarves all other planned office projects in the Bay Area, including expansion project by Samsung, Facebook, Linkedin and Google (their Bayview Campus). No potential tenant has been named, but there is speculation that it will be a huge tech company like Microsoft, Amazon, or Apple. Amenities will include 7,103 spaces of mostly underground parking (Lightrail is also across the street), an underground pool, a soccer field, and courts for basketball, racquetball, and squash. Check out photos of the modern curved glass buildings below! I really, really hope this goes through. It would be a big boost for San Jose if this happens, but it's a shame that it's so suburban in style still. Other than the building heights, it's very much a suburban office campus... buildings set back from the streets with at least some parking along the edges, all the amenities in the center and (presumably) private and closed to the public. I wish we would start to see something more like what Amazon is doing in South Lake Union in Seattle happening down here. The Samsung project at 1st & Tasman is actually much better (less suburban) than this one. I thought San Jose wanted North First to be an urban and walkable environment fit for pedestrians. 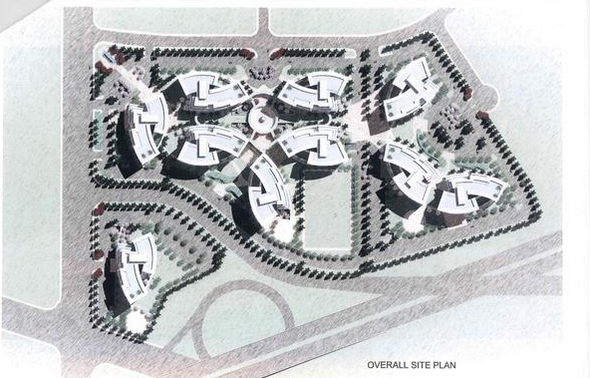 This looks like another insular campus development surrounded by parking. What a disappointment. Agreed. How is this development at all in support of the plan to grow N. 1st tall and dense? Look at the overhead official site plan image again ... sure look like every other campus in the triangle. Vast open space (with I do appreciate, BTW) -- but completely pulled back away from the street separated by parking lots and with not a bit of use to anyone but those working in the campus. And at such a major, major intersection where the casinos are getting built and a hotel -- the entire NE corner of that area becomes shut off to the public and any kind of life/activity/destination. Anon #1: Tech has ALWAYS preferred campus style buildings. Amazon has to build up beause Seattle's downtown area has no room for campus-style buildings. SFrangelino: North First is an area as large as the city of Cupertino. We can work on it one at a time, but there are some parts of the area that can certainly be walkable and some area for driving. There is nothing wrong with that. We cannot be building urban-sized buildings all over North 1st because that would dampen our city's competition for tech jobs against Mountain View, Sunnyvale, and Santa Clara who are building massive campus-style office parks. As far as office parks go, this is one of the denser ones, which is a step in the right direction. Anon #2: North 1st will grow tall and dense when it is possible. North 1st is a huge area, we cannot urbanize everything at once, and not every part of North 1st needs to be urbanized. Furthermore, North 1st is a job/residential zone. Life/activity/destination? That is Downtown's job, NOT North 1st. I see a lot of complaints here from urbanists, though I do understand your points. I would also like to say that, for an office park, this is pretty damn urban. Nicely landscaped, with barely exposed small parking spaces (all parking are underground and hidden away). Compare this with the sprawling parking lots of Cisco, Sun, Apple, Google, and this campus is already taking a major step in reducing parking frontage and trying to integrate itself with the rest of the cityscape of that zone. franco marco: it's much cheaper to build 10 7-stories bulidings than 3 20+ stories. And to be honest, I prefer your method of 3 20+ stories as well :( But unless our city pushes for it, I don't think that question will ever come up. Kansen Chu is the councilman for that District of North 1st, and the guy has not shown much for being urbanist and tall-building minded, unfortunately. I cannot believe some of the negativity. This is a massive project - 2 million square feet !!!! There is nothing not to like about this. People rave and rave about Moffett Towers in Sunnyvale. IMO, this is many orders of magnitude better. That project quite literally is an island surrounded by 2 freeways (101 & 237). It does have light rail but it's still in the middle of nowhere IMO. This one on the other hand is slap in the middle of things (North 1st street, SJC, downtown, etc). It could kick-start a lot of good things in the area. Agree with this post. Awesome project that could be just the beginning for N1 SJ! Hopefully a big time tennant takes up shop at this locale. While many of you are clamoring for greater height, the rest of N1 from 101 to Montegue is pretty much a blank slate, so there will be ample opportunity in the future to go higher; much higher! For those who are new here; my research of the Las Vegas Strip and McCarran Airport (runway orientation, distance to select strip high rises, flight paths) dictates that N1 could in theory accommodate towers in the 400-600 ft in height range (maybe even 700 ft.). All you height fans (like myself), stay tuned..
For the portion of North San Jose within the area bounded by North Fourth Street, Highway 101, North First Street and the planned extension of Skyport Drive, the maximum building height shall be defined by the airspace requirements of the Norman Y. Mineta San Jose International Airport as determined by the Federal Aviation Administration, but shall not exceed three hundred ten (310) feet in any event"
Well, city ordinances can be changed/altered. Also, Las Vegas McCarran International Airport is (like SJC) located in the USA and subject to the same FAA height rules. Doesn't make sense that 600 ft. high rises would be allowed within 1mile of McCarran runways, flight paths but along N1 in proximity of SJC. Perhaps something for city planners to look into, revisit. Thanks for the reference to city ordinance BTW. Not very promising as it stands. Okay, let's take an optimist's look at the map. 1. Anything without an asterisk is not subject to an FAA height limit. That's a lot of other colors (like the Downtown Frame Area) that could go taller. 2. That's a lot of white space with no identified limit. 3. Anthony has a point that the limits for N 1st don't seem to make sense, especially when compared to similar situations like Las Vegas. However, dealing with the FAA is presumably no picnic. I see potential up to 500 feet parallel to the airport. The main pattern plane's fly get them up and away before turning south...theyre alternate route doesn't even fly to the east. Somewhere in the 2040 general plan, threre is mention of buildings up to 900ft, way farther up 1st. And very specific layout of height distribution. It's possible anywhere I think on N1st from 880...just when is a matter of time. I think developers are afraid to ask for more height to the city. And the city to the faa. Just looked at that map. Note in red the influence area. 1st is the line untill 101...then heights clear. I imagine n1st like market st in sf. Hey Josh! Was reading over the above referenced city ordinance again re building heights and N1. Key phrase: "...in any event." It's the city setting the current height limits along N1, not the FAA. I'm sure the roof could be raised along N1 if our city starts thinking big and gets away from the idea that all our high-rises need to be downtown. Bob: "North First is an area as large as the city of Cupertino. We can work on it one at a time, but there are some parts of the area that can certainly be walkable and some area for driving." What parts of North First are walkable? I haven't encountered those yet. "We cannot be building urban-sized buildings all over North 1st because that would dampen our city's competition for tech jobs against Mountain View, Sunnyvale, and Santa Clara who are building massive campus-style office parks." Considering that about 10 articles a week come out talking about how Millennials want to live and work in urban locations, I think it would help our competition against those cities. "North 1st is a job/residential zone. Life/activity/destination? That is Downtown's job, NOT North 1st." False binary. Why not both? If people live and work in a place, they are going to desire to experience life, be active and have destinations to go to in that place. "for an office park, this is pretty damn urban." It is not even remotely urban. It looks like it would be sheer hell to walk down the sidewalk next to that thing, and the only people who will ever do it will be the 3% of employees that take light rail to work. North First is walkable around the Tasman/1st Street area. Also walkable around the new residential apartments being built as well, going all the way up to @First. Some parts of southern North 1st (such as Japantown/Ayer) are pretty walkable. There are easy access to lightrail along the entire North 1st. We're not going to fully walkable like Downtown San Jose, but we're progressing. The Millenials crave urban location, but most of the tech workforce is still located in office parks, and all the new tech campus developments reflect that. I suppose we COULD get a headstart on our neighboring cities by offering more urban-oriented office space, but it's hard to do so due to the massive expanse of space in the South Bay. We're going to need cars to get around, and with cars come parking space. It's just the nature of our region here in the South. But I do like your thinking--maybe it is time we try something totally different than the usual 5-7 stories office. Santana Row is trying for that "urban office" feel, we'll see how it pans out there. I always see North 1st as a job/residential/daily amenities zone. Our downtown needs a lot of help and it behooves us to concentrate as much entertainment/nightlife/activity options into the Downtown area as much as possible, and configure our future developments in a way to benefit Downtown. From the North 1st area, it's not hard to go south on the lightrail into Downtown, so at least we have that public transit option. Yes, I know it's a long walk to any amenities within that area. And we definitely can still put in more amenities ie plazas such as @First around that area. Hopefully the casinos will engender such a plaza and the folks who work from that office park can use such a plaza as well. This is pretty awesome, but I hope some of the demand for office space shifts to downtown. According to the SVBJ, the vacancy rate in NSJ is ~16% and developers and landlords are still scooping up land and buildings. If those numbers are accurate, then Downtown really isn't that far off from being a decent sub-market again. The current vacancy rate is ~20%, but a big chunk of that is the vacant Riverark II tower (300k+ Sq Ft), once that gets filled....I'm hopeful we'll see movement in the commercial market in DTSJ.